LeVar Burton launched his acting career while still a student at the University of Southern California. Cast in the groundbreaking role of Kunta Kinte in the landmark television series “Roots,” at 19 he found himself on the cover of Time Magazine. A seemingly impossible act to follow, Burton managed to do so in dramatic fashion, achieving further global acclaim as Chief Engineer Geordi La Forge in the iconic “Star Trek: The Next Generation” television series and in feature films. But it has been his role as host and executive producer of the beloved PBS children’s series “Reading Rainbow” that he is most proud of. Airing from 1983 to 2009, it was not only one of the longest-running children’s television shows in history, but also one of the most acclaimed, earning over 200 awards including 26 Emmys and a Peabody. Always committed to improving children’s education through innovative uses of storytelling, in 2012 Burton launched RRKidz, a digital educational publishing company, co-founded with business partner Mark Wolfe. Together they hold the global rights to the Reading Rainbow brand through a partnership with series creator, WNED/Buffalo. Reading Rainbow was reimagined to combine today’s forms of media and technology with the goal of inspiring a new generation of children to love reading. The all-new Reading Rainbow is a digital reading service filled with over 500 children’s fiction and nonfiction books, more than 200 newly produced video field trips, and new content added every week. With over 25 million books and videos enjoyed since launch, Reading Rainbow is the number one educational app on iTunes and recipient of numerous awards. In 2014, Burton turned to Kickstarter to bring Reading Rainbow to “Every Child, Everywhere”—especially to classrooms in need. The campaign met its 35-day goal of raising $1 million in less than 11 hours, and became the most popular Kickstarter campaign ever with over 105,000 backers and a final tally of over $6.4 million. With these funds, in May 2015 Burton and RRKidz introduced Skybrary, finally bringing Reading Rainbow to the web, accessible to 83% of American households. And in January 2016, the education-specific Skybrary School Edition was rolled out for teachers and students, fulfilling the promise of the crowd-funding project. Burton’s first children’s book, The Rhino Who Swallowed a Storm, a powerful and uplifting story to help children cope with the difficulties of everyday life, was published in fall 2014 by Reading Rainbow. The honored recipient of 12 Emmy Awards, a Grammy, and five NAACP Awards, Burton has demonstrated in his career that he can do it all—acting, directing, producing, writing, and speaking. He is often invited as a keynote speaker at leading education and technology events, most recently speaking at NASA, ISTE, The National Headstart Association, FAST COMPANY’s Innovation Series, and many more. 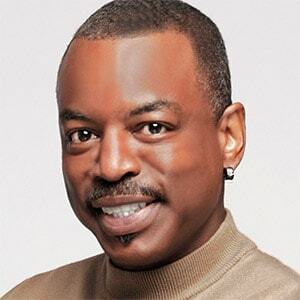 In 2014, with educational groups, business organizations, and media clamoring to recognize him for the record-setting Reading Rainbow Kickstarter campaign, Burton was named Geek of the Year in the annual Geekie Awards, was listed as one of Ebony Magazine’s Power 100, and earned the World Tech Award for Education, awarded by the World Technology Network. And in 2015, he earned the Los Angeles Times Book Prizes Innovator’s Award and the Chicago Tribune Young Adult Literary Award. In 2016, LeVar’s career came full circle, when he was co-executive producer of the re-envisioned production of Roots airing on the A&E Network. The remarkable critical and commercial success of the miniseries ensured the preservation of this important American story in the hearts of current and future generations. As he enters his fourth decade in the industry, with millions of fans throughout the world, Burton continues his mission to inspire, entertain, and educate.